At first, buying a didgeridoo may seem very straightforward. Although it's not a complex procedure, there are a few considerations we recommend you make. You need to be sure that your instrument will fulfil all your individual requirements. "Do I want my didgeridoo to be a functional, playable musical instrument, or an ornament only?" This is the first question you need to ask when considering your purchase. This less durable option has the great advantage of pliability. The flexibility of size and shape in a bee's wax mouthpiece is very user-friendly for the novice who may not yet know the optimum diameter that suits their playing. This by far the most popular option. The didgeridoo is an icon of the Australian Aboriginal culture. It therefore naturally follows that any indigenous style artwork appearing on a didgeridoo should be a harmonious and compatible part of this cultural icon. An equally important factor to consider is the authentic indigenous origin of the didgeridoo artwork. 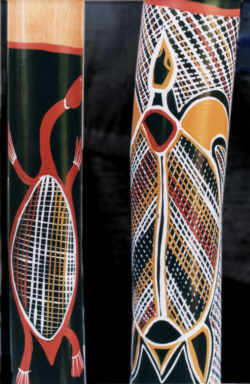 The ever- increasing investment value of genuine Aboriginal artwork on your didgeridoo is another factor to consider when making your choice. 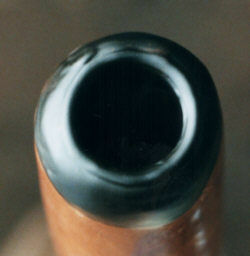 As a general rule, the sound quality of a didgeridoo is related to its value. This will be most applicable when considering the purchase of high quality musical level instruments. That said, artwork, asthetics and authenticity are also factors influencing the final price tag. Although this is not an immediate consideration for the buyer, it is an important one for the future. The didgeridoo, like any other musical instrument is a delicate, beautiful and functional piece of artwork. Protection of your valuable didgeridoo investment is essential for its preservation, especially for the traveller.